By 1860, the average U.S. citizen was becoming increasingly aware of the small change in his pockets. At long last there were plenty of coins to use in daily transactions. Less than a decade earlier, silver coins barely circulated at all, because their melt value exceeded their face value. Congress ultimately resolved that problem in 1853 by reducing the precious metal content of the nation's coinage. A few years later, with the end of large cent production and the release of millions of the new small copper-nickel cents, coin collecting began to grab a foothold, and even more people took note of the coins going through their hands. This was also a time when small change represented considerable purchasing power: Americans averaged a ten-hour working day, and the expression "a dollar a day" was quite apropos. In New York City, for instance, a salesman just starting out to sell A. Blower's patent Waterproof Composition (a compound for use on shoes and boots) could expect to make about ten cents an hour. That dime might buy a ladies Shetland wool corset, a child's ticket to see General Tom Thumb on Broadway or maybe a half-dozen good cigars. Interestingly enough, in 1860, the appearance of the now familiar dime would undergo a change, courtesy of the U.S. Mint. The addition of stars to Christian Gobrecht's uncluttered Seated Liberty dime in 1838 had an unwanted side-effect: The design would not strike up completely. It was thought that this was caused by die opposition raised portions of the design opposite one another on each side of the coin. In the case of the Stars Obverse design, the reverse legend UNITED STATES OF AMERICA was opposite the thirteen stars spread around the rim on the obverse. To remedy the situation, in 1860 Chief Engraver James Longacre switched the legend to the obverse and added the so-called "Newlin's Wreath of Cereals" to the reverse. This wreath was adapted from Longacre's pattern half dollar of 1859, and it's suggestion has been attributed to Mint "hanger-on" Harold P. Newlin. The wreath was composed of leaves of corn, wheat, maple and oak, and it would remain in use on dimes, essentially unchanged, until 1916. Unfortunately, Longacre's design change made little improvement in striking quality, even after he made further minor modifications in late 1860. Over 175 million of the Legend Obverse Seated Liberty dimes were produced from 1860 through 1891 at four mints: Philadelphia (no mintmark), New Orleans (O), Carson City (CC) and San Francisco (S). The series is punctuated by the With Arrows issues of 1873-74, a two year design change that used arrows on either side of the date to indicate a slight increase in weight. 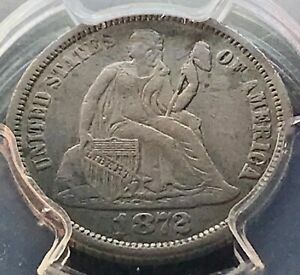 The Philadelphia Mint struck Legend Obverse dimes continuously from 1860 through 1891, while the branch in San Francisco saw production each year except 1860, with the coins from that year retaining the old Stars design, the only mint to do so after 1859. Carson City struck this type between 1871 and 1878, and New Orleans would only see production in two years, the first and last of the design. Mintmarks are located on the reverse beneath the bow in the wreath, except in 1875, when they are also found within the wreath. While the series has many "common" dates, it includes a number of very scarce issues. 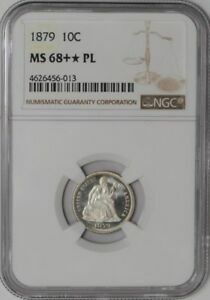 Although there are no standout rarities from the Philadelphia Mint, the coins struck from 1863 through 1869 are especially elusive and quite rare in mint condition. The short-lived Carson City run includes rare early dates and common later ones, but it embraces one of the greatest rarities in all of U.S. numismatics, the 1873-CC Without Arrows. While 12,399 examples of this issue are recorded to have been struck, only one coin is known today. It was last sold in the 1940s to famed collector Louis Eliasberg. 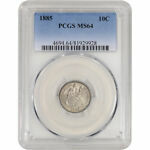 Another important rarity is the low mintage 1860-O, also extremely rare in uncirculated condition. While some San Francisco issues after 1875 number among the most common in the series, the dates before 1872 are quite scarce. The Philadelphia Mint struck one "transitional" issue dated 1859, the so-called "coin without a country." 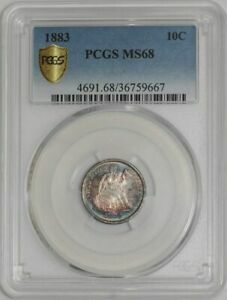 These coins retain the previous Stars Obverse design but are muled with the "cereal wreath" reverse as adopted in 1860. The coins lack any mention of the issuing authority, and all are very rare, with an estimated twelve pieces surviving. Struck by order of Mint Director James Ross Snowden and made only as proofs, these were used by Snowden as "trade bait," enticing local collectors to part with rarities they owned that were lacking in the Mint's collection. 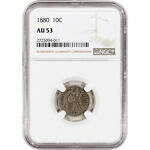 Legend Obverse dimes are one of the most popular 19th century U.S. coins and are available in a wide range of grades. Because of their smaller size, they usually have fewer abrasions than larger denomination coins. When grading this design, friction from circulation first begins to show on the head, breast and knee of Liberty; on the reverse, check the highest portions of the wreath and bow knot. Counterfeits are generally not a problem in the series, but mintmarks are known to have been removed from certain dates and added to others. This design is generally collected either by date and mint in lower grades or by type, in which case only one business strike or proof of any date is needed. In addition, a few specialists collect the series by die variety. For the type collector, this series poses no difficulty. Many of the commoner issues are often available in grades above MS 65. Small hoards of many dates have come to light over the years, including some of the Philadelphia issues of the Civil War period. Availability of mint state specimens was again augmented in January, 1985, when two original rolls of Legend Obverse dimes were dispersed. 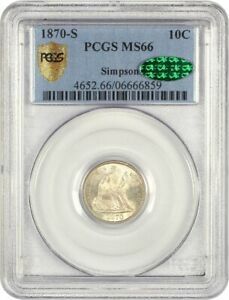 The coins were dated 1883 and 1884, and most were brilliant gems, with a number of pieces that graded higher than MS 65. With a total of 24,903 made for the series, proofs are readily available and have often been used in collections when high grade business strikes could not be obtained. They are occasionally available with heavy mint frost on the devices and deeply mirrored fields. 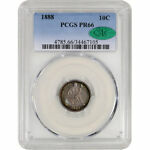 These "cameo" coins are very popular with type collectors. Legend Obverse dimes from the later years1882 through 1891are more available than other Seated Liberty coins of this era. As representatives of the design type in general, they span a period of American history that begins prior to the beginning of the Civil War and ends one year after the Western frontier officially closed. By the end of the 1880s, most people had known no other coins except the Seated Liberty issues. Many called for a new design. In 1892, the long-lasting Seated Liberty motif was finally replaced with the new portrait of Liberty by Mint Chief Engraver Charles Barber. Ahwash, Kamal M., Encyclopedia of United States Liberty Seated Dimes 1837-1891, Kamal Press, Wallingford, PA, 1974. Bowers, Q. David, United States Dimes, Quarters and Half Dollars, Bowers and Merena, Wolfeboro, NH, 1986. Bowers, Q. David, United States Coins by Design Types, An Action Guide for the Collector and Investor, Bowers and Merena, Wolfeboro, NH, 1986. Greer, Brian, The Complete Guide to Liberty Seated Dimes, DLRC Press, Virginia Beach, VA, 1992. New York Times, February 1, April 11 and April 18, 1860.